We hold inspirational cookery courses and artisan food courses in our fabulous converted mill in Bakewell, in the heart of the beautiful Peak District. We also host beer brewing courses for brewers from around the world. Our cookery courses are for people who want to be inspired to have a go and for others who want to take their cookery to another level by taking one of our cookery and baking masterclasses with some of the UK's most acclaimed chefs and bakers. Looking for a healthy option? Then try combining your love of food and the fabulous scenery of the Peak District on one of our food foraging courses. Our courses has been internantionally recognised for the quality of the tutors and the passion of our tutors with for example our cheesemaking courses being included in the FT as one of the 5 best cheesemaking courses in the country. 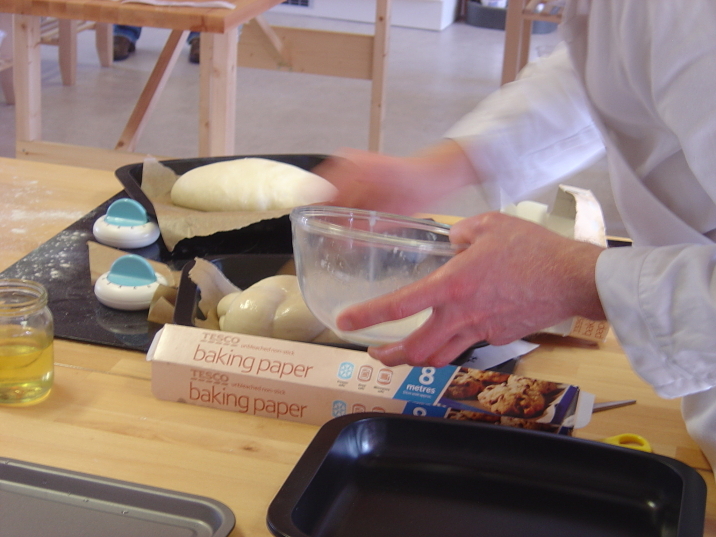 We love to tearch people the finer points of baking on our breadmaking courses. Breadmaking is all about understanding the bread dough and the interaction between yeast, flour and water and the other vital ingredient ...time. Our expert breadmaking tutors will guide you through how to bake stunning looking and tasting bread. If you like savoury baking then how about learning to bake an English classic on our Pork Pie Making Course in which we reveal and allow you to master the art of hot water crust pastry. If sweet baking is your thing what about joining GBBO star Howard Middleton who shows you how to bake fabulously and oh just incidentally gluten free on a gluten free baking course. We love food made by artisan food producers. This has inspired us to develop a range of food and drink courses to teach the curious how they can make their own artisan food. Our expert tutors will teach you how to produce your own soft cheese on a one day cheesemaking courses. Learn how to create you own bread on one of our varied selection of artisan bread making courses. Why not learn how to make beer on a beer brewing course at Brew-School? We love sweet treats too. How about learning to produce your own artisan chocolates on our one day introduction to chocolate making course. For lovers of high end desserts there is nothing to rival our Patisserie Masterclass with a course lead by one of the UK's finest patisserie chefs. For those people who love to bake then have a look at Howard Middleton's a contestant from the Great British Bake Off 'Fabulous Baking Courses'. about all the essential business tips and in sights on our setting up a coffee shop & tea room course. Hartingtons is all about fun, creativity and the theatre of food. We are located a short hop from Sheffield, Manchester, Nottingham, Derby and Birmingham but we regularly play host to foodies from around the world. You will love the spectacle of our Gourmet Supper Club with a 7 course tasting menu created by a leading chef uniquely for us and then paired expertly with wines from the Cellars of John Hattersley Wines in Bakewell with a tutored wine tasting to boot. We also love to entertain…..so treat yourself to one of our acclaimed 6 course tasting menus at our incredibly popular Gourmet Supper Club. If you or your organisation want to do something a little different Hartingtons can always put together an event that will both amuse and educate. We have hosted international and national companies team building and corporate away days including: NHBC, Jotuns, Lubrizol & Pegasus Planning. So why not get in touch?